Huckleberry Finn by Mark Twain is a classic. judged over a period of time to be of the highest quality and outstanding of its kind : a classic novel | a classic car. remarkably and instructively typical : I had all the classic symptoms of flu. 1 a work of art of recognized and established value : his books have become classics. ORIGIN early 17th cent. : from French classique or Latin classicus ‘belonging to a class or division,’ later ‘of the highest class,’ from classis (see class ). 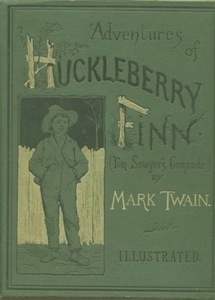 In a newly edited edition of Huck Finn and Tom Sawyer, the controversial n-word, as well as the word “injun,” has been replaced by the word “slave.” According to an article in Publisher’s Weekly, Twain scholar Alan Gribben and NewSouth Books are trying to create an edition that will encourage Twain’s work to be once again read widely in schools. I am personally opposed to institutional or government censorship, which is defined by the same obliging widget as “the practice of officially examining books, movies, etc., and suppressing unacceptable parts.” Huckleberry Finn has already been banned in many schools, and that’s the problem this edition seeks to address. The editor and publishers are hoping that this sanitized version will be admitted into the halls of bland and will open Twain’s world to a generation of students who may otherwise never read his works. And more I’ve probably missed, including the musical version below. Therefore, since Twain’s version of the book is widely available and no effort is being made to gather copies and burn them (yet), and as I’m unaware of any efforts to round up and penalize readers of the original version, I think I’ll wait a bit before I start waving the censorship banner. That’s also the reason that it matters when someone decides Huckleberry Finn will be better without the n-word. Remove that one word, and the book’s emotional impact is diluted. Reduce the emotional impact, and the work flattens. History is distorted, and there is less to feel, less to discuss, less to think about, less to remember. Dilute literature, and we’re all doomed. Words — carefully chosen words, accurate for the time and place of the text — powerfully convey a sense of time and place. School curriculum is steadily being reduced to the blandest of pablum by the knee-jerk reactions of hypersensitive adults. Dry textbook summaries are unlikely to spark any discussion, and with living literature off the table, there’s little or nothing to awaken thought or emotion. It’s little wonder that many students emerge from institutional schooling inoculated against serious thought. Twain’s entire body of work not only reveals a sensitivity toward injustice, but it also paints a vivid picture of the society and issues of his day. It’s part of the literary lens through which we can see where we’ve been, contemplate where we are, and consider where we are going. Authors are the artists whose word pictures help us decide what kind of people we want to be. Words matter. Gribben’s edition is doubtless well-intentioned and suitable for the use he intends, but I will not be recommending it for Excellence in Literature. Very well said. We share the same reaction to this news. While I understand the professor’s intent, I think it’s a literary misstep and dangerous precedent to set. Things like this are always chipped away bit by bit until they are suddenly gone.